File image of Happy Hollow's new baby lemur. 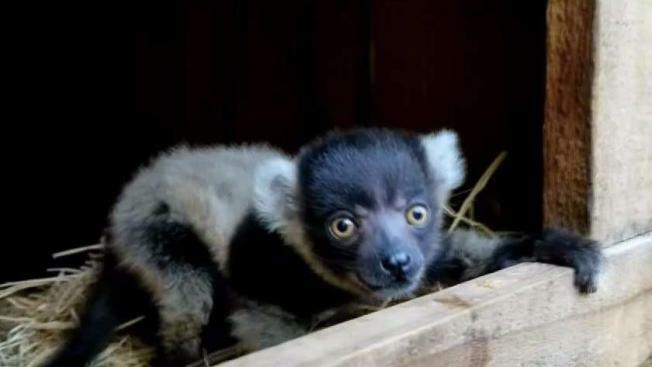 A yellow-eyed, black-and-white-ruffed, soon-to-be-leaping lemur has been born at San Jose's Happy Hollow Park & Zoo, and the public is being asked to vote on his name. The lemur, who just might outscore even a panda on the cuteness scale, was born April 6, to the excitement of zoo staff. Lemurs have been hunted and habitat-deprived almost to extinction, and the birth is part of a species survival plan for the critters. "The most important takeaway is that we are helping slow the decline of critically endangered black-and-white ruffed lemurs," Charlotte Orr, the zoo's conservation manager, said. Anyone can vote on the prospective names for the baby lemur. There are three choices: Loka, which means "prize" in Malagasy, the national language of Madagascar, lemurs' native land; Zandry, or "Junior;" or Volana, which means "moon" in Malagasy. The as-yet-unnamed lemur is described as curious, though zoo officials did not offer any information as to his online browsing history. Voting closes at 11:59 p.m. Friday.